Sometimes, things change! Maybe you want to spruce up your list, or your government passes some kind of Anti-Spam Legislation, perhaps? It’s never a terrible idea to send some reconfirmation emails to your audience. Let’s explore! 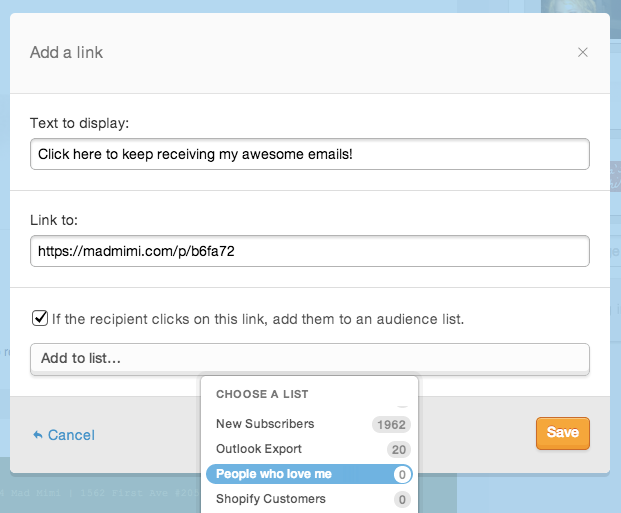 Mimi offers a really cool feature called Link to List that you can use to catalogue and segment your audience, by sending them a simple email. You’ll create an email with a link in it, that will add anyone who clicks it, to a new list in your audience. You can then follow-up however you wish, or even remove the folks who didn’t click. 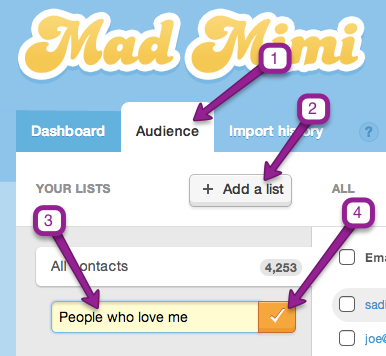 Click on “Add things” at the top of any Mimi screen, and scroll until you see the Link to List option. Turn it on, and step 1 is complete! Click on the Audience tab, and then click on the grey “Add list” button in the top left. You’ll be able to name the list whatever you’d like. “Confirmed contacts” or “Yes” or “People who love me” are some suggestions that spring to mind. Click on the orange checkbox button, to save your list name, and you’re all set. Now, even though the sole purpose of clicking on this link that you’re going to create is to be confirmed, and added to a list in your audience — you still need to send those clickers somewhere. You can either create a static “Thank You” page on your site, or you can actually just create a Mad Mimi promotion to use. Don’t send this promotion! You’re just going to use the permanent madmimi.com URL to the page, as your destination for the link. If you’re creating the page on your site, good luck! I’m sure you know what you’re doing :) You can skip to Step 4, now. Go back to your Dashboard, and click the big orange “Compose” button in the top right. Design the page with whatever images and message you’d like your reconfirmed contacts to see. Maybe something like “Thanks so much! Stay tuned for me in your inbox!” — or whatever suits your fancy. When you’ve designed your landing page to your liking, make sure to save it, and then return to your Dashboard. Click the “Share” button, under your promotion. 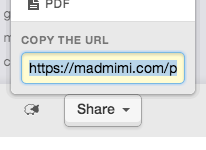 The permanent madmimi.com URL for that promotion is already highlighted, for you. Copy the URL, and proceed to Step 4! All you need to do now is create the reconfirmation link, in your email. If you’ve already created your promotion, click on “Edit”. If you haven’t, just clone an older promotion that you’d like to use as a template, or create a brand new one, from scratch! In any text module in your promotion, type in the text that you’d like to have your reconfirmation link say. Then highlight it. Click the link button, underneath the text block. Now you have the chance to paste in the URL for the page that you want these reconfirmation clickers to be re-directed to — this will either be your static page on your site, or the Mad Mimi promotion that we created in the previous step. If you’re familiar with this link screen, you’ll now notice a new addition! Tick the checkbox labeled “If the recipient clicks on this link, add them to an audience list.”, and then select the list we made in Step 2. If it all looks good, click the orange “Save” button. Now you’re ready to send your email! As always, make sure to send a test to yourself, to make sure everything looks, acts, and smells perfect. Then, send out your email, and watch the reconfirmations roll in. Definitely be sure to give it time, in order to get the full engagement of your audience. And you could even follow-up personally with the folks who haven’t clicked. Consider creating two links to lists in your reconfirmation email — one for “Yes” and one for “No”.